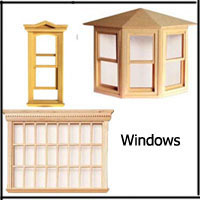 Components for building, expanding and redecorating your Dollhouse or miniature scenes. Here you will find the best in products from Houseworks.Ltd. and Classics by Handley. In most cases products are produced by both of these suppliers, those that are exclusive to one or the other will be stated. Please Note: Shipping is set up to accommodate the purchase of one item. If purchase of 2 or more will fit in the same size box and ship for the same amount as one. You will receive credit if your shipping is over-charged at the time of check out. If that is the case the shipping charge will be adjusted down prior to shipping.